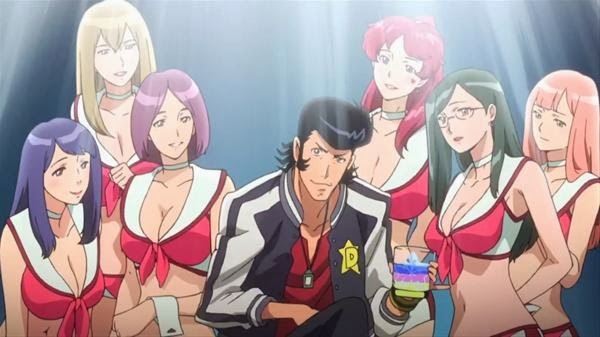 Space Dandy was always destined to catch the attention of western anime fans. Seeing Shinichiro Watanabe return to space for the first time since Cowboy Bebop, and premièring on Adult Swim's Toonami block in the US before even airing in Japan, it seemed to be a series aiming more at western sensibilities. 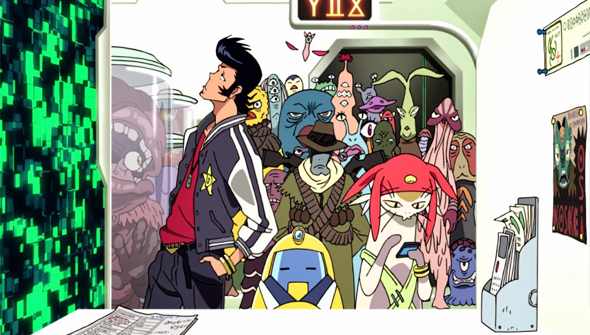 However, it's important to note early on that despite a few very superficial similarities Space Dandy is a very different kettle of fish, baby. The series follows the exploits of the pompadoured Dandy ("A dandy guy in space") who along with a cat-like alien Meow and a robot named QT, combs the galaxy for undiscovered alien species. This very basic set up is the jumping off for a madcap comedy series, complete with out-of-this-world visuals and some insanely creative writing. At its very basic level this first 13 episodes sticks mainly to an "alien of the week" format, but this is really just an excuse for a series of loosely connected stories that allow both the writing and animation staff to let their imaginations run wild. The world of Space Dandy is hugely colourful and diverse in a way that makes Guardians Of the Galaxy look relatively pedestrian. This is a vision of space that is as far away from the grittier outlook that is prevalent in most current sci-fi as you can get. Probably the way in which the series most closely relates to Bebop however, is the way the series shows huge variety. Bebop riffed on everything from kung-fu movies and film noir to Alien over the course of it's one and only season. Here, all the episodes operate within a comedic framework, but still shows off an amazing range. You'll find everything from a unique take on a zombie apocalypse to a twist on Groundhog Day. Despite the series often trafficking in decidedly lowbrow humour (see Dandy's fixation with Hooters-like restaurant Boobies) on numerous occasions it proves itself to be capable of much more. It features some great sci-fi concepts that mark it out as true comedic science fiction- rather than mere parody. For example, one stand-out episodes sees Dandy discover two aliens who are the last surviving members of their warring races, but continue their generation-spanning battle. The cause of their war? One side wears only vests, while the other only underwear. Elsewhere, the show reveals surprising depths and real heart. Early on, Dandy winds up reluctant guardian to a lost child, in an unexpectedly moving story. Later on the crew of the Aloha Oe bond with a lonely dog in an episode that shares DNA with the legendary tear-jerking Futurama episode Jurassic Bark. Although the humour allows the series to have a consistent tone, each episode manages to feel distinct. Almost every episode boasts a separate director and screenwriter, including such luminaries as Sayao Yamamoto and Dai Sato as well as Watanabe himself. Resultingly you never really know what to expect from one episode to the next. It sometimes feels less like a coherent series and more a kind of experimental playground for its creative team. A feeling that is helped by the fact that the series has little regard for continuity and merrily kills off the entire cast on multiple occasions. If that sound like a criticism, it's not meant to be: for any lover of animation this is a rewarding watch, full of fabulous visuals and inventive designs. And all the visual splendour is equalled with a high-quality soundtrack- not unusual for a Watanabe production. On the negative side of things, the portrayal of women in the series is somewhat lacking. There are few recurring female characters, and those that are there are largely stereotypical and there to be gawked at by Dandy (and the audience). The sexist attitudes of Dandy (the character) may well be intended to be satirical, but the point is moot if it's still presented in such a way. Bebop's Faye Valentine was sexualised to the nines, but was a true femme fatale- there's sadly no equivalent here. It's true that QT is voiced in both languages by a female voice actor, but that doesn't really count. 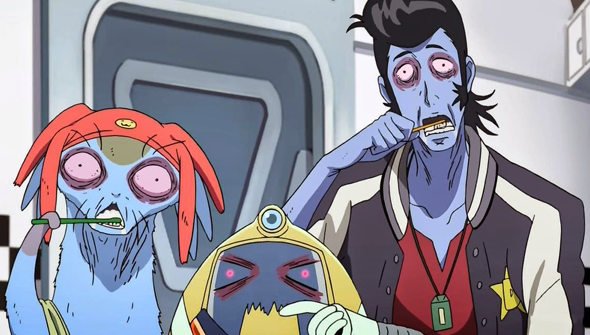 Space Dandy is above all a comedy so the key question here may be: "but is it funny?" There's nothing more subjective than comedy, so your mileage may vary- but we found that yes, it's a pretty funny show. Often more amusing than gut-bustingly hilarious- but funny all the same. Unusually for a comedy though, Space Dandy might have enough going for it to be worth watching even if you don't find it particularly funny. Just as a piece of work it's completely fascinating, and definitely worth investigating for any student of anime. Ultimately, as long as your not expecting Cowboy Bebop season 2, Space Dandy is a hugely entertaining series. Beautiful to behold, sublimely creative and mad as a bag of space badgers, this is a series that truly takes off.